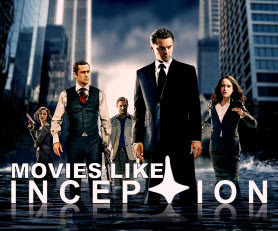 Movies Like Inception (2010) '+g+"
Check this list of recommendations for movies like inception here. Inception is a 2010 science fiction action-thriller film written, co-produced, and directed by Christopher Nolan. Leonardo DiCaprio plays Dom Cobb, an extractor who performs illegal corporate espionage by infiltrating the subconscious of his targets to extract valuable information. He is approached by the wealthy Mr. Saito (Ken Watanabe) to performing the act of inception, to implant an idea into his target's subconscious. If you like the more movies similar to inception then find the recommendations for it below and don't forget to mention if we miss any as we keep on updating this list. The Matrix is a 1999 science fiction action film directed by The Wachowski Brothers. Set in dystopian future the movie follows Neo (Keanu Reeves), a computer hacker who joins a rebellion against the machines after knowing that his everyday world is the product of a computer-driven digital matrix created by sentient machines. Shutter Island is a 2010 psychological thriller by Martin Scorsese starring Leonardo DiCaprio and Mark Ruffalo. Set in 1954 the movie follows Two U.S. Marshals Teddy Daniels and Chuck investigating the disappearance of Rachel Solando (Emily Mortimer) a murderess from the asylum on Shutter Island. Minority Report is a 2002 sci-fi thriller by Steven Spielberg. Set in 2054 the movie follows John Anderton (Tom Cruise) a PreCrime officer accused of a future crime must prove his innocence. Eternal Sunshine Of The Spotless Mind (2004),...if you can think of more, then don't forget to mention it in comments.